Since the colour of the year is Pantone Rose pink 13-1520; a wave a pastel colours popped out in the decoration sphere. We see them in dinnerware collections, cookware, paint, curtains, bedding etc… I think the most surprising use of pastels I saw was by Bluestar appliances; you can customize your stoves and other appliances in the colour you like or even just the buttons; if you’d rather to go softer on the trend. Personally, I love these refreshing and tender colours. They instantly add softness and romanticism to a room. If used subtly, it should not look to girly or childish; if that is your concern. Of course, they will add colour and softness to any baby room, where it is also easier to make bold colour choices; pink armchair anyone? 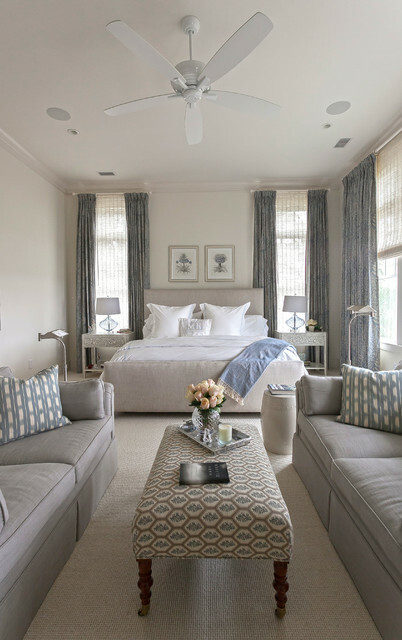 If your space allows it; try adding a small table and chairs or an armchair in the bedroom, it makes for a cosier and sophisticated space. Again, if the space allows it you can also add a vanity table or a chaise lounge. A small tray on the table with a glass carafe and two nice matching glasses and flowers on the nightstands. In terms of interior design, Scandinavian have always been very innovative. They manage to create sleek, contemporary and sophisticated pieces. With their straight, light and angular lines, they add modernism and avant-garde to a space or unclutter an otherwise overwhelming room by just switching one or few items. Think pairing a velour chesterfield-like sofa with scandinavian style armchairs . So far, I have been a bit reluctant to use Scandinavian furniture; first they are not always affordable, but it also gave a “cold” look that I wasn’t really fond of; however, the new designs have a little more depths, volume and colour, which add warmth to the design and can be paired with different styles! After going to various design shows, I really felt like my kitchen was boring (although it has brand new stainless steel appliances). I realized then, that now, more than ever before, kitchen appliances should be part of the decoration process. There are so much options to choose from; colourful ones, matte, white, black, vintage , contemporary etc… Details should be carefully picked, the buttons, the burners, the handles. This year at the various shows I went to I did see very colourful appliances, and a lot of black stainless steel ones; which is a good option if you want a change from the common silver. Personally, I’ve always had a crush for a French brand, La Cornue; the style is definitely different but it is definitely state of the art appliances. Still in the kitchen department; I saw more and more surprising decor ideas for the kitchen. Mirrors, books, persian rugs, works of art, eclectic floors and backsplashes. 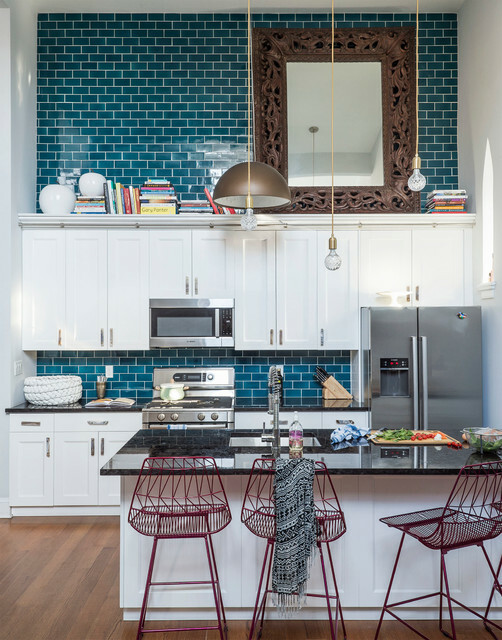 While I may not follow all the above trends, for personal taste, I look forward to incorporating some of these ideas in my future projects; a still life in the kitchen or a mirror, carefully selected books, and why not use two or more different materials or patterns. As for the bedroom, we take the bathroom the next level of grandeur and comfort by adding a boudoir like area. Again the space has to allow it, but if you have a big bathroom, then try adding a chaise lounge, an ottoman or armchairs, plants and flowers, lamps, art, anything that will make your bathroom feel like your own little peaceful sanctuary away from the craziness. Whether you’d rather use the space for something else, like a work of art or a mirror; or because you just don’t like having a black empty screen in your room; hiding your tv has never been so easy and stylish. So many makers and retailers offer sophisticated tv storage solutions. In the picture above I found on Houzz.com, we can see a stunning woodwork by Belak Woodworking LLC. 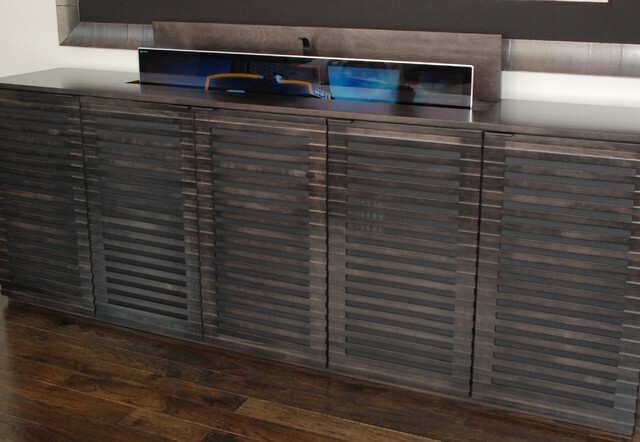 ; who would think this gorgeous buffet hides a tv?